Pre-released at Baselworld 2013, the Breguet Classique Tourbillon extra-thin automatic returns to centre-stage in a regal platinum façade. As beautiful as it is ingenious, this exceptionally extra-thin watch is accentuated by one of the most spectacular horological inventions – the Tourbillon. It is distinguished by an off-centre tourbillon with a carriage in titanium which formulation is protected by several patents. This is one of the thinnest tourbillons ever made, the height of the new 581DR calibre is only 3 mm and even after it is placed in its platinum case, this timepiece is only 7 mm thick. That is comparable to the Arnold & Son UTTE Asprey that has a little bit thinner movement at 2.97 mm but the case is 8.34 mm. Since this Breguet has several complications, it is more fare to compare it to the Piaget Emperador, another extremely thin tourbillon measuring 5.5 mm in a 10.4 mm case. 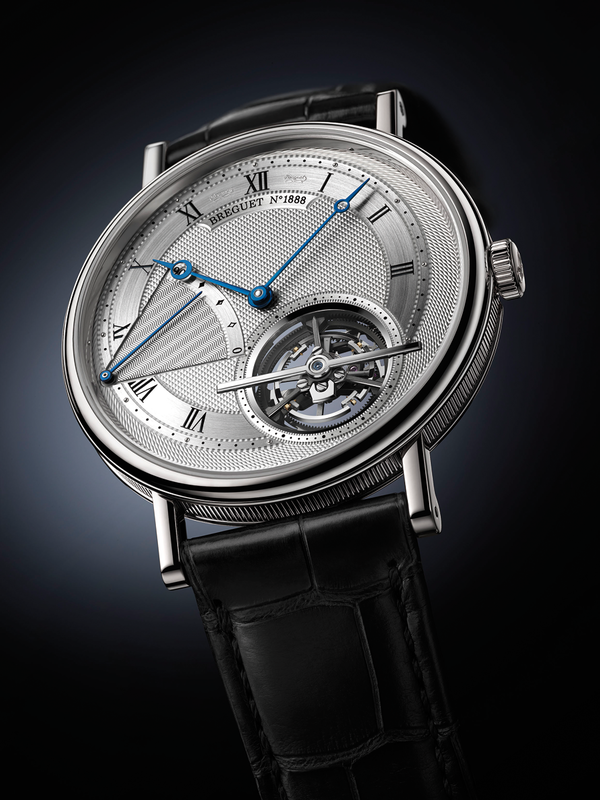 Let’s take a look at how the Breguet watchmakers managed to achieve such dimensions. First of all the movement incorporates a balance spring in silicon – making it anti-magnetic – the same goes for the escapement made of silicon and anti-magnetic steel. These technical characteristics enable the new calibre 581DR fitted into this Classique “Grande Complication” to beat at 4Hz, a high frequency for a Tourbillon. Yet the power reserve is not sacrificed. Thanks to the patented “high-energy” barrel, the reference 5377 provides 90 hours of running time. To keep the height of the movement down, Breguet’s watchmakers have placed the bi-directional platinum winding rotor on the periphery of the movement. This technical prowess makes this automatic Tourbillon one of the world’s thinnest. Stylistically, the dial of this 42mm platinum watch is decorated with four engine-turned patterns which embody a full measure of respect for high watchmaking centuries-old values: 1) a hobnail pattern for the hours and minutes chapter; 2) a barleycorn surround; 3) a straight chevron pattern for the power-reserve indicator at 8:30; 4) cross-hatching to outline each feature. A blue sapphire at the centre of the Tourbillon bridge draws the eye down from the hands. It is really exciting to see that the custodians of Abraham-Louis Breguet’s legacy are pushing their namesake’s invention even further.